To ensure those who make, install, depend on, or govern the use of scaffold and access equipment pursue the highest standards of safety, craftsmanship, and ethics. To lead the advancement and promotion of safety in the scaffold and access industry utilizing resources, education, and communication. To advance and promote working safely in the scaffold and access industry. 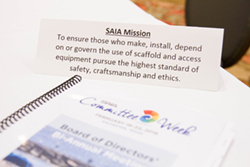 Committed to excellence in developing and promoting best practices in the scaffold and access industry. Educate through training, deliverables, and regulatory collaboration. Provide expertise, direction, and resources to industry professionals. Act in accordance with the highest professional standards, avoiding real or perceived conflicts of interest whenever possible and to disclose them to affected parties when they exist. Dedicated to the highest standards of safety in the scaffold and access industry.